Last night I was not “feeling” dinner at all. I had been under the weather all day. Sore throat, chills, headache, can you hear me whining from there? The original plan was leftover pizza. The kids had bought two large pizzas the night before and I figured since it was just Kevin, his son, and me, that pizza would be fine. But the more I thought about it, and it swam around in my cloudy brain, I couldn’t do it. I must have been delirious to actually WANT to cook when I am sick! I started poking around my kitchen and just kind of tossing things out on the counter. I guess I figured if I tossed enough things out there eventually I would be able to put a few together to make a meal. Well shock of shocks, I was RIGHT. Of course it turned out that I was going to make a mac and cheese. That is one of my comfort foods so I guess it was a subliminal thing. I am sick = give me mac and cheese. Something about that ooyey gooey cheesy goodness that just promises yummy in my tummy. I had a couple of chicken breasts that I had poached a couple of nights ago with another recipe I made. I decided to poach all of the breasts I had so I would have some cooked chicken to work with later in the week. I must have been psychic! So I defrosted the chicken boobies and got to work. You could substitute just about any cheese you want in this recipe. 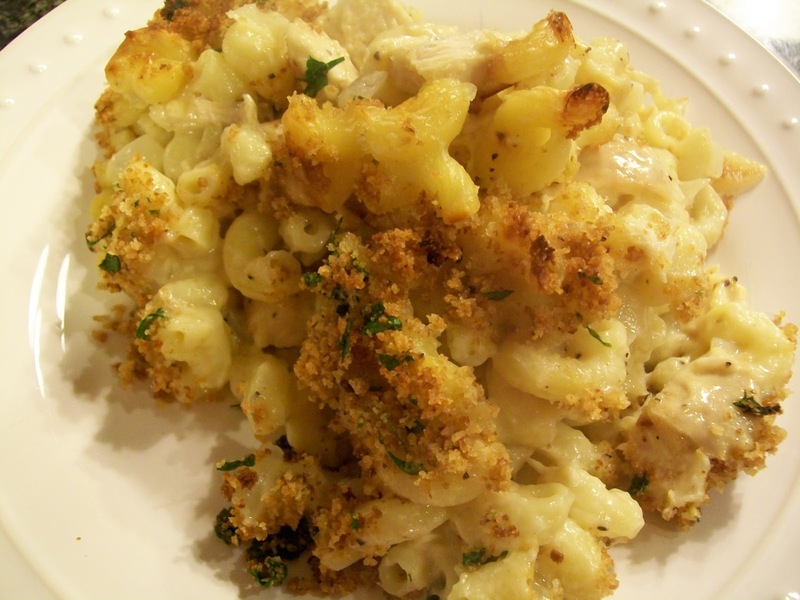 That is the beauty of a mac and cheese and why it is so versatile. I had Gruyere because I am making a quiche tonight, but I knew I wouldn’t use it all in one dish so grabbed some of that, and sharp cheddar, and parm. TADA dinner!! Into a large pot of boiling salted water add the macaroni and cook according to the directions on the package, 6 to 8 minutes. Drain well. In a large skillet over medium heat, add the onions and garlic. Cook until onions soften, about 5 to 7 minutes. Toss the chopped chicken in 1 to 2 minutes, just to warm it up. Meanwhile, heat the milk in a small saucepan, but don’t boil it. Melt the butter in a medium pot and add the flour. Cook over low heat for 2 minutes, stirring with a whisk. While whisking, add the hot milk and cook for a minute or 2 more, until thickened and smooth. Off the heat, add the Gruyere, Cheddar, salt, pepper, and nutmeg. 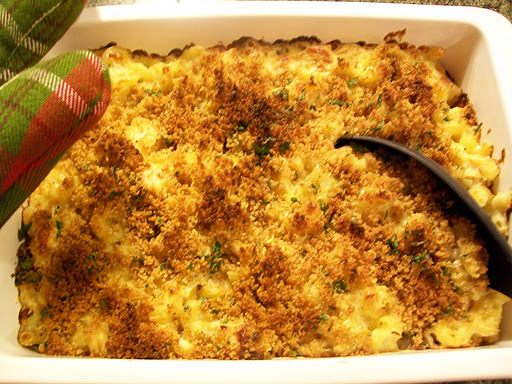 Add onion mixture and cheese to the cooked macaroni and then place it all into a casserole dish. Melt 1 tbs butter in sauce pan add bread crumbs mix well. Toss in the parsley and combine. Remove from heat. Sprinkle the bread crumb mixture over the top of the pasta. Bake for 35 to 40 minutes, or until the sauce is bubbly and the bread crumbs are browned on the top.